RADM Lilly was born in Belzoni, MS. 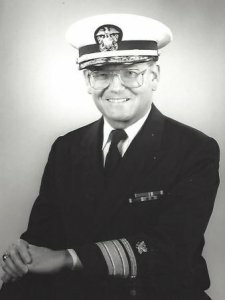 In 1955, he received his Bachelor of Business Administration degree from Tulane and his commission in the Supply Corps, USN. He obtained his LL.B. degree in 1960 and J.D. degree in 1968 from the University of Mississippi. As a flag officer, he also attended the Executive Program in National & International Security, Kennedy School, Harvard University. After receiving his commission, RADM Lilly attended the Navy Supply Corps School, Athens, GA. Upon graduation, he served as Supply & Disbursing Officer of the USS Betelgeuse (AK-260), an attack cargo ship attached to COMSERVLANT, which was used primarily to provide support to the Sixth Fleet in the Mediterranean. He then served as Disbursing Officer & Assistant to the Supply & Fiscal Officer, NAS Sanford, FL, where he completed his active duty service. Upon his release from active duty, he joined the Naval Reserve while attending law school. Before his promotion to flag his assignments included Supply Officer, Air Wing Staff79 and. Later NARDIV 791, NAS Memphis, and Commanding Officer, ASB (Advance Supply Base) 109, New Orleans. His active duty periods in the Naval Reserve included, inter alia, service at Atlantic Fleet Headquarters, Naval Supply Systems Command and Office of the CNO (Logistics). Following his promotion to Rear Admiral, he served for six years as Commander, Naval Reserve Cargo Handling Force, which included twelve NR Cargo Handling battalions comprising 92 percent of the Navy’s combat stevedores. He was awarded the Legion of Merit in 1988 for his leadership of the Cargo Handling Force and Navy Commendation Medal in 1977 for service as Exercise Commander of a National ASB Exercise involving all 18 NR ASB units. RADM Lilly retired from the Naval Reserve in 1988. His retirement ceremony was held in McAlister Auditorium at Tulane, in lieu of the Naval Reserve Center New Orleans, which was under renovation at the time. RADM Lilly is a life member of the Military Officers Association of America, the Association of the United States Navy, the Naval Order of the United States, the Reserve Officers Association and the Navy League. He also holds membership in the Military Order of World Wars. He is a past president of the MS. Dept., Reserve Officers Association and the Central MS Council of the Navy League. Upon receiving his law degree in 1960, he served as an associate with Stovall & Price, Corinth, MS, and, in 1962, was appointed Assistant U. S. Attorney for the Northern District of MS in Oxford, starting a few days after the riot at Ole Miss. In 1966, he joined the law firm of Wise Carter Child & Caraway, Jackson, MS, where he served as president, 1990-92. In 1994, he and a former partner formed the law firm of Lilly & Wise in Jackson, and remained a member until 2001, when he became of counsel until his retirement in 2003. As a practicing attorney, he was admitted to practice before all MS state courts, the U.S. District Courts of MS, the Fifth Circuit Court of Appeals, the U.S. Court of Military Appeals and the U.S. Supreme Court. His professional affiliations included membership in the Hinds County Bar and the MS Bar. He was also a member of the American Bar Association for many years. He held leadership positions in the Federal Bar Association (FBA), Washington, DC, at the state, regional and national levels. He served as a member of the national executive committee for seven years, including service as president (1979-80). He was elected a Fellow in the MS Bar Foundation and also in the Federal Bar Foundation. He served several years as a member of the Board of Governors of the National Lawyers Club and the Board of Directors of the Democracy Development Institute, Washington, DC. RADM Lilly and his wife were delegates to the 19th World Methodist Conference in Seoul, Korea, 2006 and were members of the American delegation to the Eurasia United Methodist Conference in Moscow, 2002. He has also served in leadership positions in various other local civic and charitable organizations in both Jackson and Oxford, MS.
RADM Lilly is married to the former Constance Holland of Jackson, Tennessee, and they live in Oxford, MS. They have three children and five grandchildren.